OneDesk’s Customers & Accounts application allows you to keep all information about your customers and their companies in one place. The customers & accounts can be accessed through the applications drop-down. The application is divided into two modes. In the customers mode, you can create and invite customers. It is important to note that adding/creating customers is different from inviting customers. 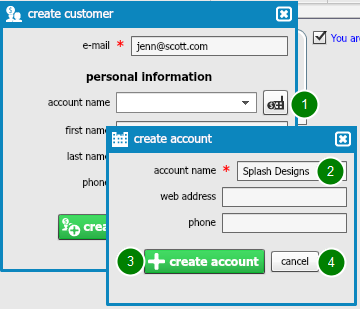 After adding/creating as many customer records as you wish, you may invite them. They will then receive a registration e-mail inviting them to collaborate with you through OneDesk. There are two ways customer accounts can be created. It can be created as you are creating the customer. – Click on the create new account button next to the account name field (1). – Enter the customer company information in the create account window that appears (2). The account name field is required; the rest are optional. – Click create account (3). If you decide that you do not want to create the customer company, click cancel (4). – Go to the accounts mode (1). A create account window will appear. – Enter the account name, and optionally, the web address and phone number (3). – Click Create Account (4). If you decide that you do not want to add the company, click Cancel (5).